What is a ZEV mandate? Who adopted a ZEV mandate? 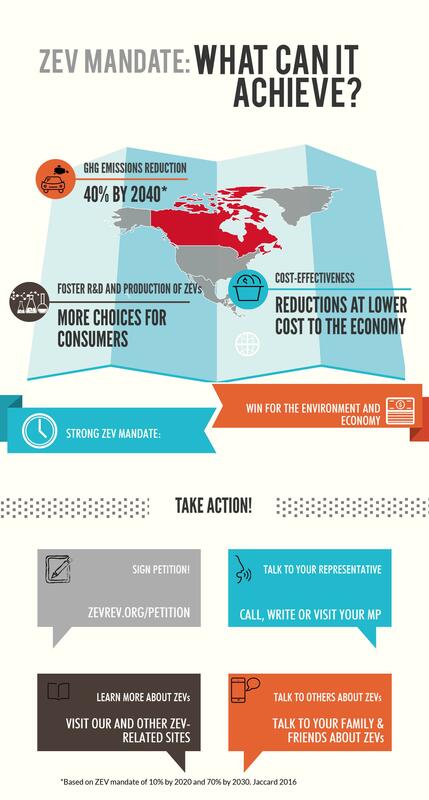 Who supports a ZEV mandate? ZEVs at a tipping point? WELCOME TO THE CAMPAIGN FOR A STRONG CANADA-WIDE ZERO-EMISSION VEHICLE (ZEV) MANDATE! Greenhouse gas emissions from transport account for 24% of Canada's emisisons. A greater share of electric and other zero-emisisons vehicles is needed to reduce these emissions. For this, a number of policies are needed, including a zero-emission vehicle (ZEV) mandate. Such a mandate would be directed at large automakers, and would encourage them to develop and market more ZEVs. This, in turn, would lead an increase in market share of ZEVs and to reduction in transport-related greenhouse gas emissions. Let's get the Canadian government to adopt a strong nation-wide zero-emission vehicle mandate! What is a Zero-emisison vehicle (ZEV) mandate and why we need it? The exact number is based on the automaker's overall sales. It's aim is to ensure automakers research, develop and market ZEVs, which do not emit GHGs. Why is a ZEV mandate needed? GHG emissions from transportation accounted for 24% of Canada’s total emissions in 2015, that is, ONE in FOUR tonnes of GHGs was from TRANSPORTATION. Increasing the market share of ZEVs would reduce Canada's GHG emissions. This, in combination with other market-based policies and smart regulations, will enable Canada to meets it Paris climate deal target (30% reduction from 2005 levels by 2030). There are several policy options for increasing the market share of ZEVs including providing incentives for potential buyers, developing an adequate infrastructure such as a network of charging stations for electric vehicles, and implementing a ZEV mandate. Professor Mark Jaccard of Simon Fraser University (SFU) has suggested that having a balanced and flexible ZEV mandate with a target of 10% of new vehicle sales, that is one in ten new cars sold would be a ZEV, in 2020 and increasing to 70% by 2030 could lead to a 40% reduction in transportation-related emissions. A study by the Simon Fraser University indicates that the current supply of electric vehicles is inadequate, and that increasing the supply to 56 models would greatly increase market share. In a report in 2017, the Ecofiscal Commission argued that a ZEV mandate would be more cost effective than some other measures. So, an evidence-based, balanced and flexible ZEV mandate could be both economically sound and effective. What can a ZEV mandate do? ZEV mandate is considered one of the more progressive climate policies. As a result of the ZEV mandate, over 1.5 million ZEVs are expected to be sold in California alone by 2025. An additional 1.5 million ZEVs would be sold in the northeastern states of the US. Research by Professor Mark Jaccard suggests that a “balanced and flexible PZEV-ZEV mandate in Canada that will require automakers to achieve targets of 10% ZEVs of new sales by 2020 and increasing to 70% by 2030 would reduce annual emissions by 40%. This is equivalent to having a carbon price of $100-150/tonne of CO2e. Jonn Axsen of SFU suggests that a national ZEV mandate in Canada that is aligned with Quebec’s and California’s ZEV targets would facilitate achieving the goal of 40% ZEV sales by 2040. Furthermore, he argues, with such a mandate, purchase incentives such as rebates could be eliminated in the long term. Sign our online petition urging the federal government to adopt a strong, evidence-based ZEV mandate.